One of the most powerful features of iOS is also one that is often overlooked: voice dictation. Siri may get all the press for being a great personal assistant, but she may be at her best when she is simply taking notes. Voice dictation is available for both the iPhone and the iPad. It may not be the best choice for those who need to write lengthy emails or create large documents, but for most of us that find the on-screen keyboard a bit unruly when typing more than a line or two, voice dictation can be just enough to skip buying a wireless keyboard for the iPad and to make the iPhone a viable alternative to our laptops when composing email. Even if you need multiple paragraphs and special punctuation, voice dictation can handle it. However, older devices may need an internet connection to do the heavy lifting. Starting with the iPhone 6S and the iPad Pro, Apple devices no longer need an internet connection for voice dictation. Believe it or not, voice dictation is as easy as one-two-three. Tap the microphone button on the device's on-screen keyboard. 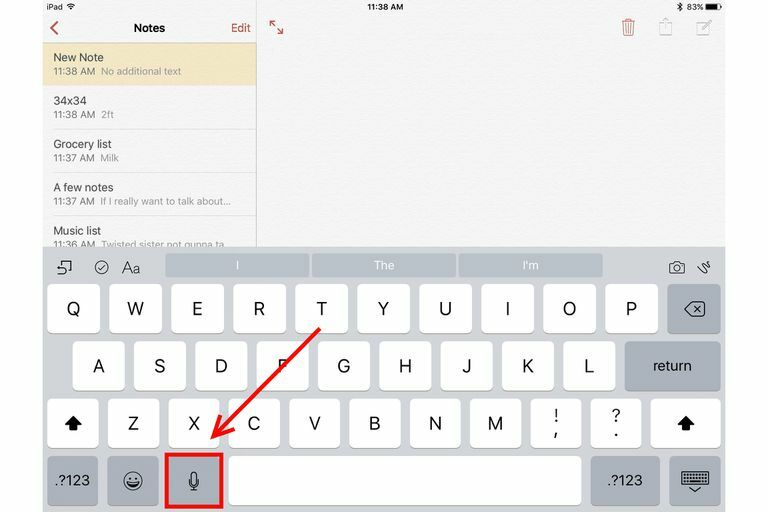 This tells the iPhone or iPad that you want to start dictating. Talk. The device will listen to your voice and turn it into text as you talk. Be sure to read over the keywords below to find out how to start a new sentence or a new paragraph. Tap the Done button that appears onscreen to stop dictating. It may take a few seconds to turn the last words into text on the screen. Be sure to read it over. Voice dictation isn't perfect, so you may need to make a few adjustments using the keyboard. The great thing about this implementation is that voice dictation is readily available any time the on-screen keyboard is available, which means no hunting around for it when you really need it. You can use it for text messages, email messages, or just taking notes in your favorite app. A feature that's available on the iPhone (but not the iPad) is the Voice Memo app. You can use this app to keep voice recordings of anything from notes to reminders if you need them and all you have available is your iPhone. "Period": The "." is the standard way to end a sentence. It includes a space after the period, so you are ready for your next sentence. "Question Mark": The "?" also includes a trailing space. "New Paragraph": This keyword phrase starts a new paragraph. Remember to end the previous sentence before beginning the new paragraph. "Exclamation Point": The "!" includes a trailing space. "Comma": The "," includes a trailing space. "Colon": The ":" includes a trailing space. "Semi-Colon": The ";" includes a trailing space. "Ellipsis": The "..." includes a trailing space. "Quote" and "Unquote": The " produced by saying "quote" does not produce a trailing space. The " produced by saying "unquote" does include a trailing space. "At Sign": The "@" symbol. And more... A number of other punctuation marks are also programmed into the system, so if you need one of the rarer marks, simply say it. For example, "upside down question mark" will actually produce an upside down question mark.